Load some samples onto your pads and start jamming. The Akai MPC series of sampler workstations, originally designed by electronic drum guru Roger Linn, are instruments of legend in the hip-hop community. Their responsive pads and classic swing grooves made them perfect for beat-makers, who would dissect samples from records, map them out across the pads, then sequence patterns on the fly. This type of pad-based jamming can be replicated with a regular drum sampler plugin. Begin by mapping out a handful of melodic samples over different pads, then tune and roughly level each one. By punching out riff ideas with a MIDI keyboard or pad controller, a basic combination of samples can be auditioned in time with your beat and bass groove. Each sample can be reversed, enveloped or edited individually. If any samples don't fit the bill, simply scroll through your samples folder to find another. With the accompanying audio examples, you'll hear our basic groove and piano stabs slowly develop into a collage of keys, vocal chops and samples. Step 1: A stuttering, sample-based hook would suit this bare hip-hop groove, so we open a drum sampler (NI's Battery 4) and load a selection of stab samples across several pads. Our sampler's mixer channel is sent to a short reverb, which will place the sounds in the same 'room'. Step 2: It's quick and easy to come across a starting point for a riff, simply by cycling through sounds in our samples folder while jamming notes on a MIDI keyboard. 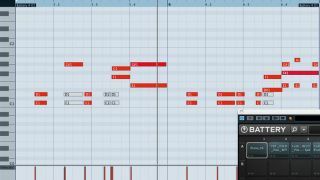 A few basic piano stabs are recorded in, with a longer harp sample slotting in between. Step 3: The piano needs more treble, so a second high-passed piano hit is layered over the first. Battery 4's master saturation and limiting effects are applied, dirtying up the various samples and helping them sound like they all emerge from the same 'sampled' source. Step 4: A small vocal chop, guitar hit and other stabs are recorded in around the main hits. These new elements are treated in different ways; most are layered with other pitched-down sounds, reversed, stuttered and filtered to help them fit together in the mix. Step 5: Once the main groove has been created, a final edit section is crafted by pitching down duplicate copies of the harp and vocal. To make the most of this change, we mute the drums and bass for the final beat of the track, isolating the new melodic elements. Step 6: EQ is applied to Battery 4's output - a first instance removes bloated mid frequencies, then a second device lifts up the high-mid and treble ranges. For unity and levelling, liberal analogue-style compression slams the sounds together even more.